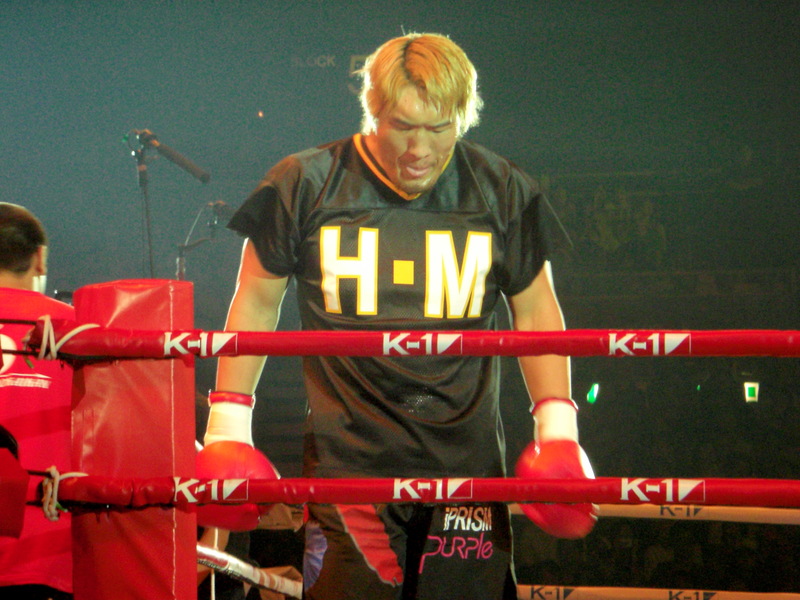 Jose Canseco finally made his MMA debut yesterday, entering to the song “Wild Thing” against 7′ 2″ 33o pound Hong Man Choi in Yokohama, Japan. Unlike Canseco’s last foray into the ring — against noted pugilist Danny Bonaduce — where the fight was called a draw, this one ended in a clear decision; 77 seconds into the fight Canseco tapped out. “That’s a big man,” Canseco said after the fight. “I ran into one of his left jabs and that almost knocked me out. You have no idea how scary it was facing a man that big.” Canseco landed the first punch of the evening an instant into the fight but that was the extent of his inflicted damage, from then on Canseco danced around the ring doing his best to avoid the long reach of Choi. While trying to get away from Choi, Canseco grabbed at his knee at one point and then tried to kick Choi a second later, Choi pushed the former baseball star to the mat and started pummeling his head. Once more left with just the coward’s way out, Canseco tapped out. 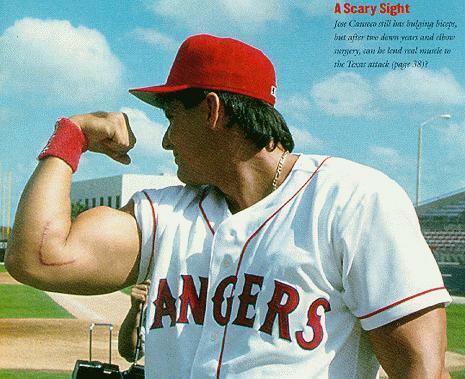 I am incredibly confused though about one thing; when Canseco fought Bonaduce his body was COVERED in tattoos but against Choi, Canseco just had a couple arm tats, what happened to the other ones? For photographic comparisons, take a gander after the jump. 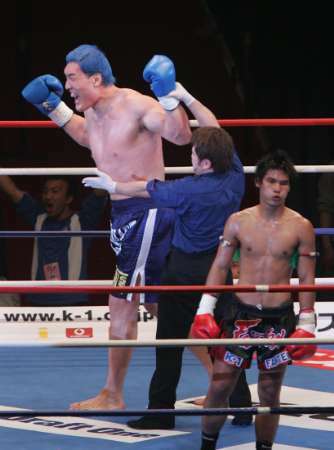 I guess fighting Danny Bonaduce wasn’t enough of a challenge — even though Bonaduce fought Canseco to a draw when they faced off in January — because Jose Canseco has signed up to fight 7-foot-2 Korean kickboxer Hong Man Choi at the Dream 9 mixed martial arts tournament in Tokyo on May 26th. Jose is gonna get WRECKED. I know he needs money but there has to be a better way. 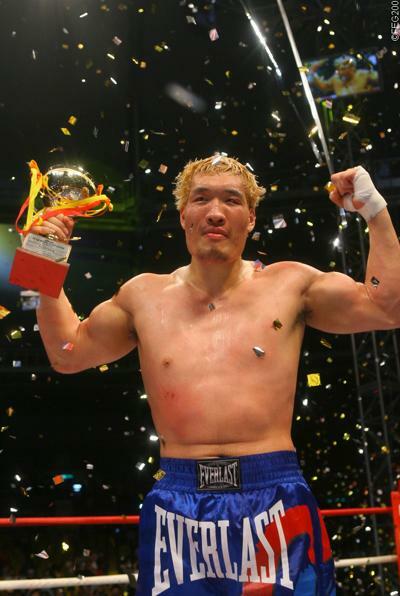 Hong Man Choi is a GIGANTIC MONSTER of a human being and I’m terrified of him in picture form. Even though Choi doesn’t have a sterling record in the ring, neither does Canseco and Choi is definitely going to destroy him. Does Vegas take bets on whether or not a fighter will die in the ring? Does it make me a bad person for even asking? The fight will be on PPV, I need to scrape up the cash for it immediately. Saturday night featured one of the boxing events of the century, although, based on media coverage no one noticed. In a 3-round match in suburban Philadelpha, Jose Canseco fought former Partridge Family member Danny Bonaduce to a draw. Since we know that simply can’t be the case, let’s just assume that Canseco’s body is a giant marshmallow. “For a guy my size to hit him like that and he didn’t go down, wow,” Canseco said. “If he were my size, he probably would have knocked me out of the ring.” However, the crowd of 1,500 were none too impressed by what was supposed to be the big draw with many filing out before the judges even announced their decision. Stick around after the jump for photos from the event and Canseco doing his best impression of the Juggernaut. Also, when did he get all those crazy tattoos? I had no idea he had a full suit, that’s crazy! Also, to whet your appetite for the rest of the photos, here is Danny Bonaduce, true athlete, warming up just prior to the match. What an epic fight schedule! My only question, why do Canseco and Danny Bonaduce look like they are about to viciously make out in the photo. That’s not intimidation, that’s love! 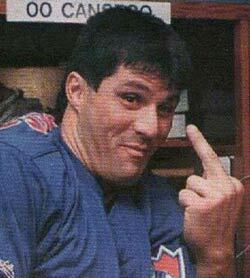 Fox’ piece of television trash, Moment of Truth, has signed on the biggest money grubber of them all, Jose Canseco. The show, on which participants are asked the most personal and embarrassing of questions and, if they are willing to tell the true answers to a national audience it is worth cash, is likely to lose a lot of money on Canseco since the man has zero shame and doesn’t care who he takes down with him. Canseco already has taped the episode and according to my source that was in attendance during the taping, Canseco was asked if he ever injected Mark McGwire with steroids and if he ever corked his bat among other questions that were asked during the taping. The episode of “The Moment of Truth” with Canseco is supposed to air in late September or early October. Jose Canseco is a douche, we’ve established this, it seems though, that his bad luck continues to follow him. First he gets blackballed by baseball because he can’t hit a fastball or a breaking ball anymore and can’t play in the field, the NERVE! Now, in an attempt to qualify for US Weekly’s “Stars They’re Just Like Us” (using the term “star” very very very loosely) Jose admitted that his Encino home was foreclosed upon. It seems that Jose’s manse, which admittedly seems quite nice, with its 7000 square feet and stylish front door design, has over $2.5 million owed on it. What the Surreal Life money didn’t cover that? “I’ve been out of the game for about eight or nine years and obviously this [is an] issue with the foreclosure on my home,” he told “Inside Edition”. “I do have a judgment on my home and it to me is very strange because it didn’t make financial sense for me to keep paying a mortgage on a home that was basically owned by someone else,” he said. How very astute and responsible of Jose. Fortunately, he’s not actually homeless like most people would be after having their home foreclosed on, but he ain’t doing great neither. Canseco said much of the money he earned from playing ball went to pay for his divorces. “I had a couple of divorces that cost me $7 or $8 million.” Yowzers. Then again, if I had to be married to a ‘roid using, tiny dicked Jose Canseco I too would clean him out in a divorce. Now to clarify, I don’t HATE Jose, I just think he’s a scumbag. 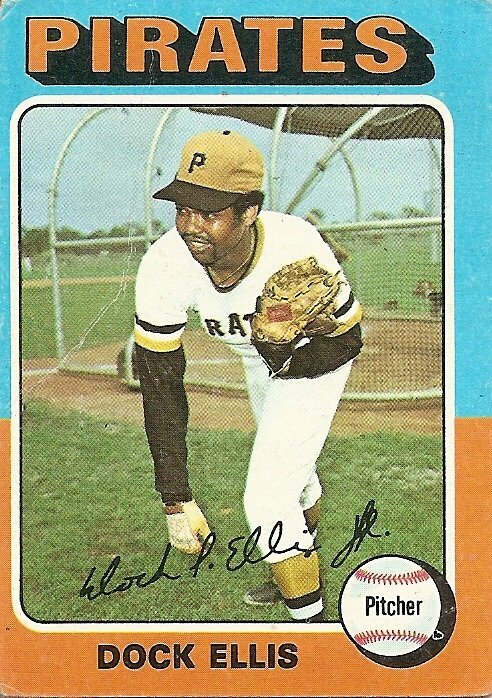 In his first book, “Juiced,” I appreciated and believed the things he wrote about the various players who used steroids. And he was vindicated when other evidence came out about those players, but then Jose’s humongous ego came back into play. At that point it became about how baseball kicked him out for telling the truth, (not because he simply wasn’t good enough without the steroids and that his body was breaking down and his reaction time was non-existent) and about how Jose believed himself to somehow be the rescuer of baseball on some giant white stallion. With “Vindicated” he seems to simply be making up stories for the sole purpose of selling books. That’s fine, but that’s called fiction, and he shouldn’t pretend he’s doing otherwise. However, I am glad about this story about his home. Not so much because he lost his house because as toolsy as he is, that still is a major jones, but, more because I found out that Jose used to live in Encino. It makes so much sense now! Jose is really just a caveman found and unfrozen by Paulie Shore and Sean Astin and who ended up becoming a baseball player! I can’t believe it has taken us this long to realize. 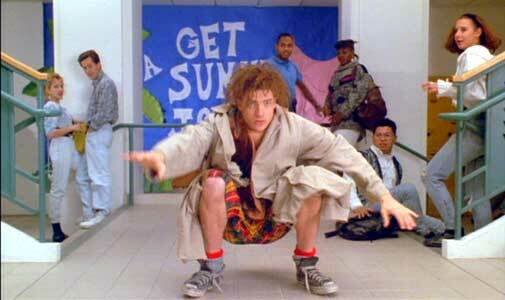 Much like how “Vindicated” is fiction, Encino Man is cinema verité! The truth comes out at last!